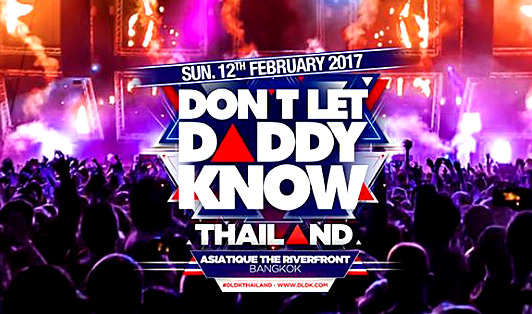 Don't Let Daddy Know is coming to Thailand on the 12th of February 2017!! #DLDKTHAILAND is making its debut at Asiatique The Riverfront, Bangkok. #DLDK is one of the biggest electronic dance music brands in the world. Huge venue, mind-blowing visuals and special effects, and guaranteed a mind blowing line-up that has recently brought together the likes of Martin Garrix, Steve Aoki, Skrillex, Dimitri Vegas and Like Mike, Steve Angello and many more.